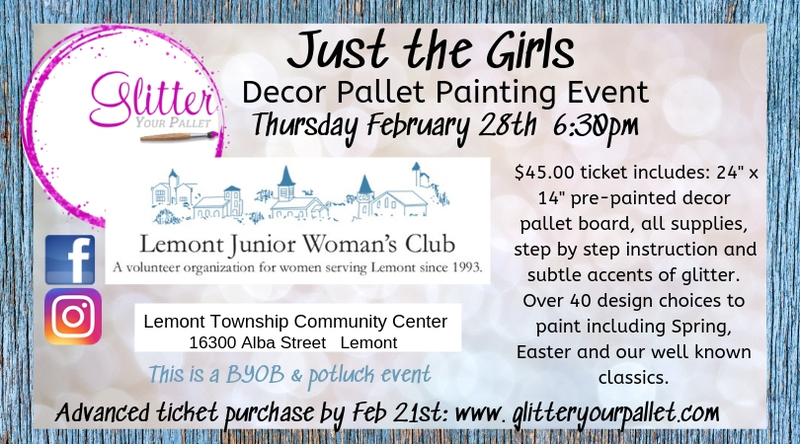 Lemont Junior Woman’s Club and Glitter Your Pallet are pleased to offer you the decor pallet board painting event. Join us on Thursday February 28th@ 6:30pm. 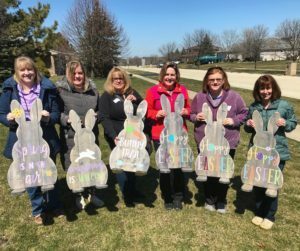 $45.00 ticket includes: a 24″ x 14″ decor pallet board, pre-painted or stained. Choose the color of your board the night of the event) All supplies included, subtle accents of glitter applied by our instructors. Over 40 designs to choose the night of the event including, St. Patrick’s Day, Spring, Easter and our well loved classics. HUNGRY? This is potluck event. Please bring an appetizer or dessert to share and pass. THIRSTY? This is a BYOB event. ***BE SURE TO PURCHASE YOUR RAFFLE TICKET AT THE EVENT FOR OUR STANDING BUNNY WORKSHOP. He stands 3 foot tall and makes the perfect statement piece for Spring. All proceeds will be donated to the Lemont Woman’s Club.